The foot is made up of different bony segments and multiple joints, and the metatarsal bones are found between the midfoot bones and the bones of the toe. Metatarsalgia is a common orthopaedic problem defined as pain in the metatarsal segment of the foot, and is one of the most common type of foot pain. Pain is usually felt during weight bearing, like walking and running. 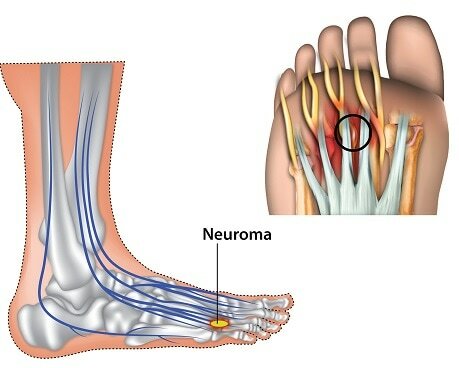 About 80% of the general population will experience pain in this region of the foot in their lifetime. Despite its prevalence, however, it is less well understood when compared to disorders in other regions of the foot. It does seem to be widely accepted that altered biomechanical factors, which involves how the body moves and how force acts on the body, are the main cause. Such altered biomechanics are often present in the walking or gait cycle, where as one walks, the ankle abnormally pronates or rotates inwards, distributing shearing forces on the tissues of the metatarsal heads. Metatarsalgia can be classified as primary, secondary or iatrogenic, depending on whether the causative (and usually biomechanical) factor is directly or indirectly related to the forefoot (primary and secondary respectively), or induced by medical examination or treatment (iatrogenic). Secondary to systemic conditions such as arthritis, gout, bunions, stress fractures and bursitis. Metatarsalgia is actually a symptom itself, and not a diagnosis. It is defined as pain in the metatarsal region of the foot that is aggravated by walking, standing and jumping. The pain can be described as either burning or aching or as a shooting pain. It can also present itself as a tight or numb feeling in the toe or as a sensation similar to having a stone stuck under one’s foot. Findings from a physical examination would reveal tenderness in the metatarsal region, and the clinician might also find calluses under the affected metatarsal heads. A thorough history should also be noted. Conservative management is traditionally prescribed for metatarsalgia, and affected persons can actually treat the symptom without having to see a general practitioner. Rest, ice, elevation, stretching, cushioning, shaving of the calluses present under the metatarsal heads and the use of anti-inflammatory medicines are usual components of this regime. It’s advised to avoid activities that can aggravate the pain, and do low-impact sporting activities such as swimming and cycling instead of sports that involve running and jumping. An ice pack can be applied for 20 minutes several times a day to help alleviate the pain. Changing footwear may also help to eliminate factors that cause metatarsalgia; shoes with plenty room and a cushioned sole are recommended. Shock absorbing insoles or pads may also help. Since obesity is a known risk factor, maintaining a healthy weight is essential for those overweight. For pain control, paracetamol or ibuprofen can be prescribed. Conservative treatment can be attempted for a few weeks before considering any further steps. If symptoms do not improve, or the pain significantly hinders everyday functioning, one should seek the advice of a general practitioner. Surgery may be recommended in order to correct alignment the balance existing between the metatarsals and/or muscles/ligaments. Arie, E. K., Moreira, N. S., Freire, G. S., Dos Santos, B. S., and Yi, L. C. (2015) Study of the metatarsal formula in patient with primary metatarsalgia, Rev Bras Ortop 50, 438-444. Quirk, R. (1996) Metatarsalgia, Aust Fam Physician 25, 863-865; 867-869. McPoil, T. G., and Schuit, D. (1986) Management of metatarsalgia secondary to biomechanical disorders. A case report, Phys Ther 66, 970-972. Coughlin, M. J. (1997) Metatarsalgia: a symptom, not a diagnosis Current Orthopaedics 11, 1-10. Esherick, J. S. (2009) Tarascon Primary Care Pocketbook, 3rd ed., Johns and Bartlett Publishers, USA. Trask, D. J., Ledoux, W. R., Whittaker, E. C., Roush, G. C., and Sangeorzan, B. J. (2014) Second Metatarsal Osteotomies for Metatarsalgia: A Robotic CadavericStudy of the Effect of Osteotomy Plane and Metatarsal Shortening on Plantar Pressure, Journal of Orthopaedic Research.